Today we want to share 10 of our favourite teacher appreciation gifts . Christmas is one of the busiest times of the year and while we are looking for just the right gift to surprise our loved ones it’s also a wonderful time of year to recognize our teachers (and don’t forget your babysitters or child care professionals)! My kids have great teachers and even though gift-giving is not an expectation I still want them to know that they are having a positive impact in my children’s lives. What TO get– we rounded up our 10 favourite teacher appreciation gifts they are going to love! Let’s take a moment to discuss the hardest teacher to buy for… the MALE teacher! What did you decide on for the perfect teacher appreciation gift? That peppermint sugar scrub does sound nice. I’d like to make and gift that to my son’s teacher here! These are such great ideas! Teachers are so important and these are new fresh ideas, not the same old tired gifts. Great ideas. I really like this creative gift ideas and thanks for the male teacher ideas..
I’ve often wondered how un-thrilled teachers must be with the same gifts all the time. These make great ideas for a change! As a former teacher, I would have loved any of these gifts! It’s nice to know your students are thinking about you! These are all great ideas. I like that you mentioned male teachers because they really are harder to buy for! I find gift cards are great for them. These idea’s are so cute! I will be gifting my kids teachers Bath and Body Works Candles this year, thanks to the black friday sale1 Woohoo! Yes, you can’t forget the teachers! They work so hard all year round and deserve our respect for teaching our kids. We found out that my son’s first grade teacher loves lady bugs, so I’ve been collecting lady bug themed things through out the year to include in a little gift for her that includes a resturant gift card. I figure everyone eats. I made the mistake one year of doing a coffee themed present, but it turned out that teacher didn’t like coffee, she was a tea drinker. Sometimes you have to think a little bit more outside the box when it comes to gifts. These are great ideas. My daughter has a male teacher this year. Thanks for the ideas for male teachers. I have a few teachers to shop for this year. These are some great gift ideas for teachers. I love giving gifts of food. I know it’s something everyone can appreciate and enjoy! Awesome ideas! I bet they really love the soap one, because of all the germs they’re around. Such fun and lovely gifts. My mom who was a teacher for many years was always so touched by gifts that the students brought her! I always dread special holidays and end of the school year because I feel I need to get something for my son’s teacher. I never know what to get though! Those are some really good ideas! Sweet and practical gift ideas. I really like the sugar scrub, nail polish/mistle toes and thanks a latte ideas. There are some pretty cool gift ideas there! I haven’t got kids at the moment but I remember handing out christmas cards to teachers when I was at School. Sugar scrubs that’s a great idea… I make them all the time !! Its the only thing I use sugar for in my house haha !! I was just thinking that I need to start figuring out presents for the teachers! 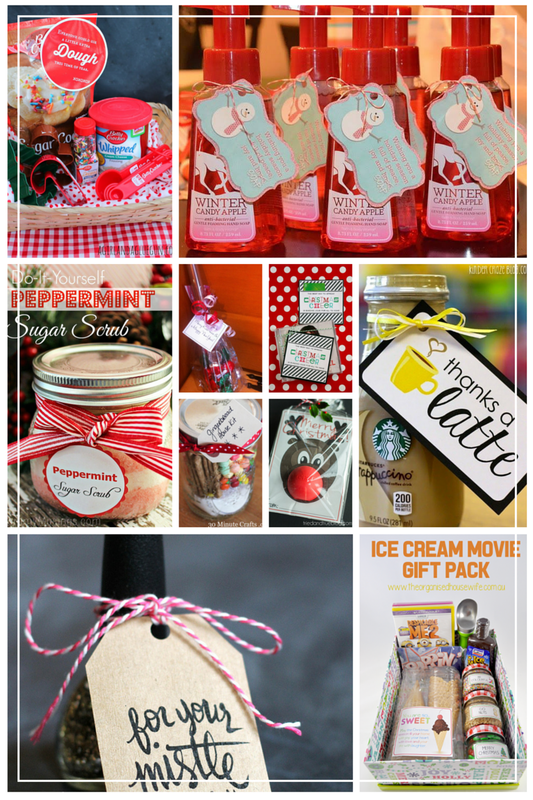 These are such great ideas and I especially love the peppermint sugar scrub!